Certainly no “strangers” to us here at May The Rock Be With You, we’ve been patiently awaiting the full length album release Persona Non Grata from these Sydney rockers for a little while now. Having seen them earlier this year supporting the like of The Darkness and Calling All Cars, Strangers deliver a brand of rock that is devoid of the image based hyped that is so often relied upon by new bands in this day and age. Released October 12th, Persona Non Grata was produced and recorded by Tom Larkin (Shihad, The Getaway Plan, Calling All Cars). When they rock, Strangers well and truly rock and deliver some pretty infectious stuff such as the Triple J featured singles Red Brick and Bred For Breeding. Title track Persona Non Grata is the latest single and video and you can check that out below. Musically, Strangers sit somewhere in amongst all bands previously mentioned thus far – except exchange The Darkness with Queens Of The Stone Age. 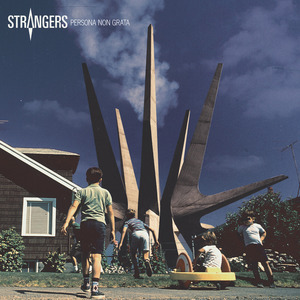 For those familiar with producer Tom Larkin’s past work – yes Strangers do similarly carry that massive, booming rock sound. Having seen them live though, it’s a sound that is easily created in the live setting and boy can these guys play, particularly with their twin guitar attack!. When they slow the tempo right down, that’s where for me the Queens Of The Stone Age type references come in. Things get a little sludgier, a little more intense, a little less melodic. The triple play of Far Too Late, Searching The Low and Heiress slows the album right down, before the blazing’ angsty rock of Glitter Kids really picks things up again. Closing track Long Snake Moan on the other hand is a massive dose of gargantuan sized classic rock riffage to finish off.